The Management Committee of the COST Action Pearl PV (Performance and Reliability of Photovoltaic Systems: Evaluations of Large-Scale Monitoring Data) has recently successfully completed its third meeting at University of Lisbon (Faculdade de Ciencias) in Lisbon, during which representatives from 24 countries were present. The Management Committee discussed among others the Action’s progress and the next steps with regards to the short-term scientific missions, the work plan of the various working groups, valorization panel meetings, training schools, seminars and other important matters. 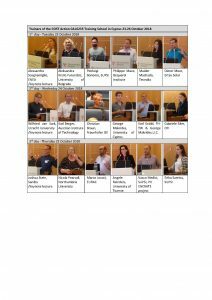 After the MC meeting had taken place on the 25th February, workshops started during which Working Group leaders and participants discussed the results to date, the work plans and tasks of the Working Groups. At these WG workshops the individual research plans were updated, while links with other WGs were also discussed. Prior to the workshops that were organized on the 26th February, both a proposal writing workshop and a plenary meeting took place. 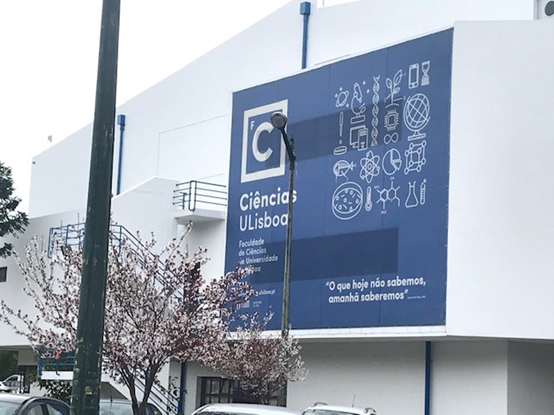 Finally, on the last day of the Pearl PV events in sunny Lisbon, an interesting excursion to a CPV plant in Evora took place! Pearl PV like every Cost Action is a bottom-up science and technology network, open to researchers and stakeholders with a duration of four years. In the framework of this Action, a range of networking tools will be actively utilised, such as workshops, conferences, training schools, short-term scientific missions (STSMs), and dissemination activities. 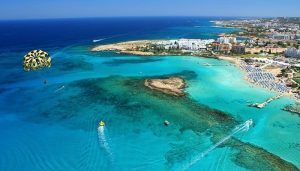 The next meetings – comprising a Seminar and a Training School – will be held in Malta in Fall of this year. Exact dates and location will be announced soon on the website of Pearl PV. 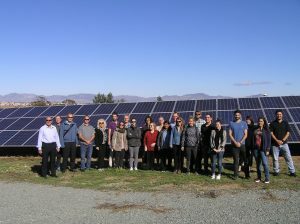 The EU COST Action PEARL PV (Performance and Reliability of Photovoltaics Systems Evaluations of Large-Scale Monitoring Data) has been organizing a weeklong of events between the 22nd and 26th of October 2018. 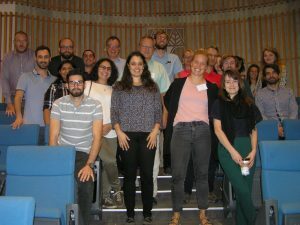 The PEARL PV events kicked off on Monday 22nd October with a Seminar of Working Group 1 on “Matching PV data and PV performance research questions”. During the opening session, the Ambassador of the Kingdom of the Netherlands to Cyprus Ms. Nathalie Jaarsma gave an inspiring address to the audience consisting of PV experts from 31 countries from Europe and beyond. 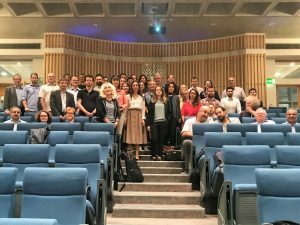 The Seminar was followed by a four-day training school on “Monitoring and simulation of the performance and reliability of photovoltaics in the built environment”, with 50 participants from the field of research and development in the renewable energy sector. Both events were hosted by the University of Cyprus. 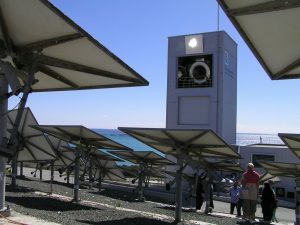 This COST Action’s aim is to improve the energy performance and reliability of photovoltaic (PV) solar energy systems in Europe leading to lower costs of electricity produced by PV systems by a higher energy yield, a longer lifetime and a reduction in the perceived risk in investments in PV projects. The objective will be achieved by analyzing data of the actual monitored long-term performance, defects and failures in PV systems installed all over Europe to quantitatively determine the absolute influences of components rated performance, key design of systems, installation, operation, maintenance practice, geographic location and weather factors on the performance, performance degradation over time and failure modes of these PV systems. For more information, you may visit the Action’s webpage https://www.pearlpv-cost.eu/ or contact the Science Communication Manager at Deloitte’s Innovation & Entrepreneurship Center (tel. : 25868611, email: eloucaidou@deloitte.com). 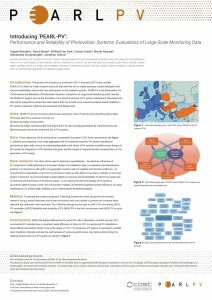 PEARL PV was presented with a Poster by the Vice Chair of the Action Dr. David Moser, at the Quality and Sustainability of PV Systems Conference organized on 3 May 2018 in Brussels, by the European Technology & Innovation Platform PV. Prof. Angele Reinders, who is chairing Cost Action PEARL PV, participated in the WCPEC-7 World Conference on Photovoltaic Energy Conversion between 10-15 June 2018 in Hawaii, where she presented PEARL PV. Core Group Meeting at University of Stuttgart. Pearl PV’s Core Group met in Stuttgart on 17 May 2018, in order to discuss the Action’s progress in relation to the working groups and the forthcoming events in the Fall in Cyprus. 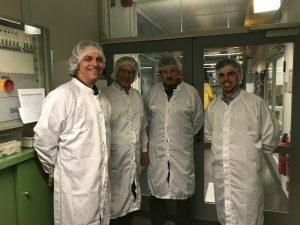 Markus Schubert, from University of Stuttgart, hosted the meeting and organized a very interesting lab tour of IPV and the excursion to ZSW. University of Cyprus is hosting two events of the EU COST Action PEARL PV (Performance and Reliability of Photovoltaics Systems Evaluations of Large-Scale Monitoring Data) in the week of 22nd to 26th of October 2018. The PEARL PV events will kick off with a Seminar of Working Group 1 on “Matching PV data and PV performance research questions” on 22 October, followed by a four-day training school on “Monitoring and simulation of the performance and reliability of photovoltaics in the built environment” scheduled from 23 to 26 October 2018. The events will take place at the FOSS Research Centre for Sustainable Energy of University of Cyprus that plays a key role in research and technological development activities in sustainable energy in Cyprus and internationally. FOSS aims to bring together researchers, PhD candidates, Post Docs and R&D people from around Europe and promote effective cooperation between them that, in turn, will enable exchange of innovative ideas on renewables and specifically solar energy and also to develop the necessary synergies in order to create the impetus for the advancement of the field of PV systems. All participants are more than welcome to visit our state of the art facilities in the Photovoltaic Park of the University of Cyprus where high quality research in the solar energy technologies is conducted in order to develop a research portfolio into the area of renewable energy sources with emphasis on solar and PV systems, harnessing thus the excellent solar resource that exists in Cyprus. Looking forward to welcoming you in Cyprus in Fall 2018! Our Action’s MC Members have actively participated in various events organized during the first Grant Period. 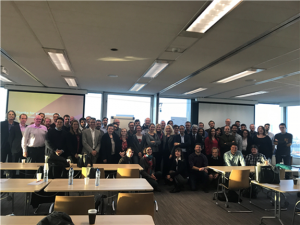 Dr. Angele Reinders, the Action’s Chairwoman, participated in February in the #SEPV Meeting in Barcelona, where she presented Pearl PV’s first poster! 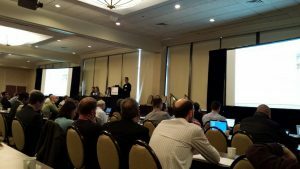 Dr. Marios Theristis attended the 2018 NREL Workshop on the topic of PV Reliability, which took place in Denver of the United States between 27 February and 1 March 2018, where he presented a fact Poster of the Action showing its 4-year plan and working group 5 PV in Grids. The Management Committee of the newly approved COST Action “PEARL PV” (Performance and Reliability of Photovoltaic Systems: Evaluations of Large-Scale Monitoring Data) has recently met in Brussels for the second time, in order to discuss the action’s progress and the next steps with regard to the short-term scientific missions, the work plan of the various working groups and other important matters. In addition, a Valorisation Panel Meeting was organised with an aim to discuss the industry’s expectations and obtain feedback directly from stakeholders. Prior to the MC meeting and the Valorisation Panel Meeting both held on the 23rd of January 2018, parallel workshops were successfully organised on the 22nd of January 2018, during which work group leaders and participants discussed the work plan and tasks of the working groups and defined the key research topics. 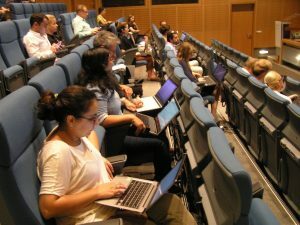 A plenary meeting also took place where the findings from the parallel workshops were presented. Pearl PV like every Cost Action is a bottom-up science and technology network, open to researchers and stakeholders with a duration of four years. In the framework of this Action, a range of networking tools will be actively utilised, such as workshops, conferences, training schools, short-term scientific missions (STSMs), and dissemination activities. Following the Action’s approval, the first MC meeting was successfully held in Brussels on the 5th October 2017. See here for more details about this COST Action CA16235.